I always get excited when I stumble across new ingredients. I’ll try anything as long as it’s not a joke or a dare. Or fugu. Or a still beating snake heart. Or a Ginster’s pasty. 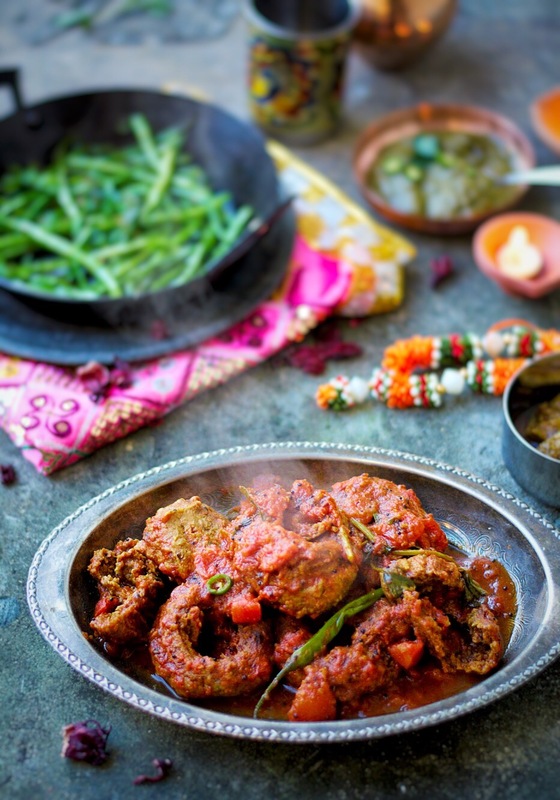 The food that really captures my imagination and makes my appetite dance around with anticipation is Indian. The spices, the variety, the flavours, the smells, the occasional cartoon version of me with steam coming out of my ears all get me going. If I go too long without some form of Indian food, my curry levels drop and I need treatment. That just doesn’t happen with any other cuisine for me. As much as I love rich, subtle and elegantly robust French food and the beautiful simplicity of Italian food, it’s just not the same level of wonder. I made one of my regular, but too infrequent trips to Tooting last week to seek inspiration and hopefully a green chilli pakora or two from Ambala if I timed it right. (They’re at their best straight from the fryer, before they’ve had time to sit around and lose their enthusiasm). I didn’t time it right, they didn’t open for another hour. Instead, I managed a spicy container of chickpea chaat failing dismally at pretending I was walking through the street-food markets of Mumbai on a cold January London morning. My favourite shop since the much missed Dadu’s mysteriously closed down is now V&B, not too far down the traffic-filled road. As I was loading the trolley with things I had no idea about, and vegetables I photographed the names of to Google when I got home, I found a packet of ‘Punjabi wadi’. The word wadi looked similar to ‘vadi’ to me -you’ll be impressed at my deduction there- which are one of my favourite snacks, so in they went. (There is a recipe here). These dried lentil dumplings turned out to be a popular Punjabi ingredient, which should come as no surprise to the sharper among you. The packet instructions suggested cooking them in a tomato based sauce and that’s exactly what I did. I followed the instructions and even looked up on the internet what they are supposed to look and taste like and what texture they are supposed to be. I got everything right. I’ll not be making them again. These are from an extensively vegetarian cuisine, but I’d rather have ande ki sabji, the tomato and egg dish, or chana masala. They are equally quick to make, and you’re quite likely to already have the ingredients in the cupboard. If you’re vegan though, these may be a winner. The sauce was delicious, the accompaniments and flavours all tasty. I just couldn’t get along with the texture. Almost meaty, quite substantial, but a little reminiscent of compacted damp cardboard. Perhaps my mind can be changed if ever I’m in Amristar, but it won’t be my life’s mission. You can buy these online if you want to try them, but if I’ve not filled you with excitement and ambition, use the sauce base for an aaloo egg curry. I’d recommend trying the radish pods (mogri) if you can get hold of them, they were simple, tasty and fun. And I bought the sarson ka saag ready-made. It’s a dish I love, but can be tricky to get the right leaves. Make the tomato sauce by heating the oil in a heavy saucepan then adding the mustard seeds. When they start to pop, add the remaining spices, cook for thirty seconds on a low heat then add the ginger and wadi then cook for a further minute. Add the tomatoes and water and simmer away for ten minutes. Slice the green chillies and throw in the pan toward the end of cooking. Meanwhile, heat a sauté pan for the mogri and add the oil and mustard seeds. When they start to pop, add the remaining ingredients and toss around the pan for a couple of minutes until they’ve cooked a little but are still crunchy. Warm the sarson ka saag and serve everything together.